There is a subtle danger in a man thinking that he is fixed for life. It indicates that the next jolt of the wheel of progress is going to fling him off. Life, as I see it, is not a location, but a journey. Life flows. A man ought to be able to live on a scale commensurate with the service that he renders. There are two fools in this world. One is the millionaire who thinks that by hoarding money he can somehow accumulate real power, and the other is the penniless reformer who thinks that if only he can take the money from one class and give it to another, all the world's ills will be cured. Change is not always progress. … A fever of newness has everywhere been confused with the spirit of progress. A business which exists to make one man or one family rich, and whose existence is of no moment when this is achieved, is not solidly founded. None of our men are 'experts.' We have most unfortunately found it necessary to get rid of a man as soon as he thinks himself an expert because no one ever considers himself expert if he really knows his job... Thinking always ahead, thinking always of trying to do more, brings a state of mind in which nothing is impossible. There's enough alcohol in one year's yield of an acre of potatoes to drive the machinery necessary to cultivate the fields for one hundred years. An educated man is not one whose memory is trained to carry a few dates in history - he is one who can accomplish things. An imitation may be quite successful in its own way, but imitation can never be Success. Success is a first-hand creation. I don't know whether Napoleon did or did not try to get across there and I don't care. I don't know much about history, and I wouldn't give a nickel for all the history in the world. It means nothing to me. History is more or less bunk. It's tradition. We don't want tradition. We want to live in the present and the only history that is worth a tinker's damn is the history we make today. For most purposes, a man with a machine is better than a man without a machine. It is not usual to speak of an employee as a partner, and yet what else is he? 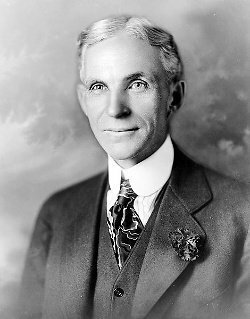 Bio: Henry Ford was an American industrialist, the founder of the Ford Motor Company, and the sponsor of the development of the assembly line technique of mass production.